This is a wonderful opportunity to hike the Yorkshire Three Peaks as part of a small group on Saturday 14th Sept.
For this Yorkshire Three Peaks day challenge on Saturday 14th Sept, 2019, we will be starting and finishing from the Broadrake Bunk Barn where we are based for our all inclusive weekend option. The Barn is on the route, close to Chapel-le-dale and provides a great base for meeting up, food and relaxing after the challenge. There are 8 places available as a Three Peaks day challenge, plus there will be 18 people staying at the bunk barn also on the hike. The reason for this is that we have just found that some people prefer to find their own accommodation and some prefer to book as a package. So please be aware that you will be part of a group of about 26 in total, some of whom will be day hikers and some will be booked at the bunk barn for the weekend. We will have two leaders, so we are likely to split the group into two at some point, to make smaller more manageable groups. 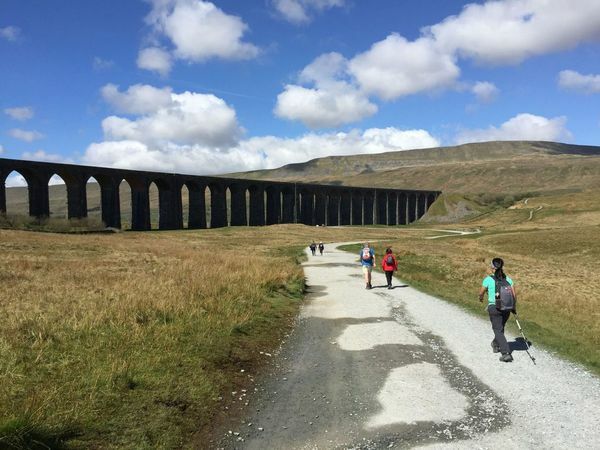 The Yorkshire Three Peaks day challenge route is 24-miles long, and includes 5,200ft (1,585m) of ascent, there is no driving involved between the peaks and the aim is to complete the challenge in under 12 hours so walking in the daylight.